KTM Duke 125, 200, 250 and 390 have all contributed in the past month taking total sales to 5,699 units. KTM Duke, offered in D125, D200, D250 and D390 variants has seen good results over the past month with February 2019 sales at 5,699 units. 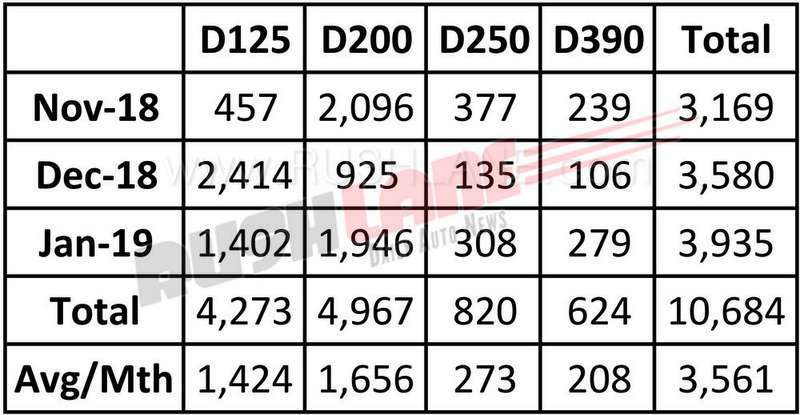 New Duke 125 sales topped the charts with highest sales in February 2019 at 3,014 units as against sales of 2,053 units of the Duke 200, 343 units of Duke 250 and 289 units of Duke 390. Taking total sales of KTM Duke models to 5,699 units. KTM Duke 125 has replaced the Duke 200 as the best selling Duke in India. Priced from Rs 1.18 lakhs, Duke 125 is the most affordable KTM on offer in India. Taking into account sales of the Duke 125 in December 2018 and January 2019, also saw the Duke 125 bring in good numbers. December 2018 sales of Duke 125 were also the highest among the four at 2,414 units as against sales of 926 units of Duke 200, 135 units of Duke 250 and 106 units of Duke 390. Total KTM Duke sales in that month stood at 3,580 units. January 2019 saw Duke 125 sales at 1,042 units along with sales of Duke 200 at 1,946 units and sales of Duke 250 and Duke 390 at 308 units and 279 units respectively. 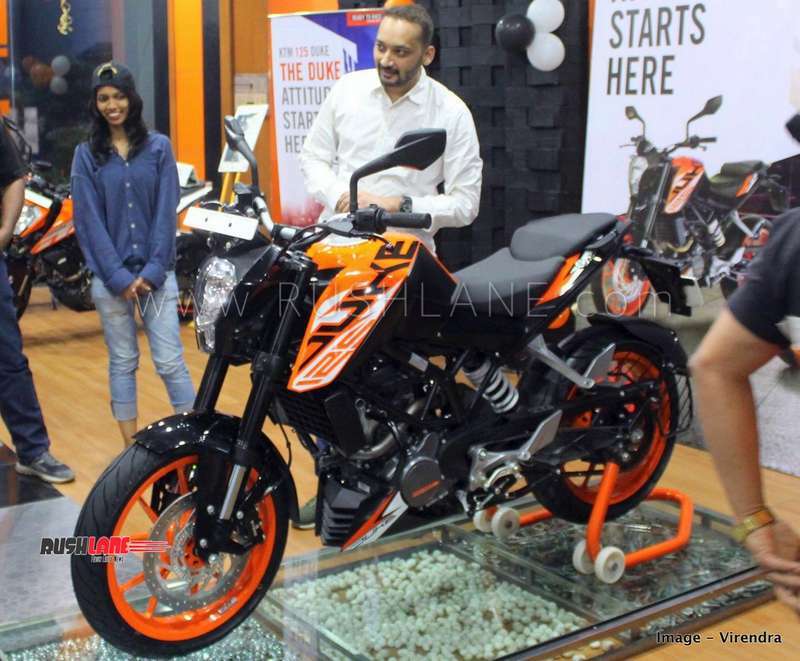 KTM Duke 125 was launched in November 2018. It is priced at Rs.1.18 lakhs and has delivered excellent sales results ever since launched. It is based on the Duke 200 and gets its power via a 124.7cc fuel injected, liquid cooled engine offering 14.5 bhp power at 9,250 rpm and 12 Nm torque at 8,000 rpm. KTM Duke 200 gets more powerful by 10 hp and 7 Nm over its 125 sibling. Its 199.5 cc liquid cooled, DOHC engine offers 24 bhp power and 19.2 Nm torque mated to a 6 speed gearbox. 2019 KTM 250 ABS was launched earlier this month at Rs.1.94 lakhs, Rs.14,000 over the cost of the non ABS variant. It gets dual channel ABS; unlike the Duke 125 and 200 which are offered with single channel ABS. KTM Duke 250 continues to be powered by the 250cc liquid cooled single cylinder engine offering 30 hp power at 9,000 rpm and 24 Nm torque at 7,500 rpm mated to a 6 speed transmission as seen on its earlier counterpart. The most powerful of the four, KTM Duke 390 gets powered via a 373.2cc, single cylinder, 4 stroke, liquid cooled engine offering 43.5 PS power at 9,000 rpm and 37 Nm torque at 7,000 rpm mated to a 6 speed gearbox.